You were arrested for robbing a museum? Ok, first – I did not rob the museum. I mean, sure, I was eager to get a look at the Trimbolen artifacts, but I’m not going to break into a storage room to do so! Besides, I was deep in the Academy archives working on my final project when it all went down. But someone called in an anonymous tip that I was involved with the break-in, and that led to guardians busting in my front door and arresting me and one of my housemates. Next thing I know my dad shows up at the station, takes me to some sort of safe house, and tells me he’s not really a retired librarian but rather some sort of elite, magic-casting guardian who saved me from a cult when I was a baby. He thinks that the museum robbery and my arrest are signs that the cult is trying to find me. I mean, c’mon. Magic? Really? Does magic not exist on Thelios? Thelian society is built on science and technology and knowledge. Magic isn’t supposed to be a thing, but apparently the Global Government has known about it for years and my dad is by all accounts the most powerful magic user in the world. They’ve been keeping it and the Alfath – the cult I was born into – a secret to avoid panic. So, yeah, everything I thought I knew about my world, my father, and myself has been revealed as a big lie. What was the scariest thing about these revelations? That Dad was right. The Alfath wanted me back and wouldn’t stop until they found me. Other high-ranking magic users had been killed or gone missing, and Dad was the last paladin. He moved me to his headquarters to keep me safe while we worked on a way to find and stop the Alfath, but they attacked first. What was the worst part of the attack? I was pretty sure they wouldn’t hurt me, but I knew they would kill anyone else who got in their way. I could feel it, sort of like the way you can feel the throb of a heavy bass line in music. I could hear this murderous intent and knew I had to do something to keep them from hurting anyone else. Did it work? Were you able to stop them? Sort of. “Kidnap victim” sounds too much like a damsel in distress. The point is, I made a decision, acted on it, and it saved the lives of people I’ve come to care about very much. I pretty much had to start over when Dad moved me to the Lyceum, but one of the first people I met was Bet. She was a commander in Dawn’s Light and is the one who raised my dad, so I guess you could say she’s my grandmother. Even though she’s retired, she still pretty much runs things around the Lyceum as an admin officer. She’s also the only person I’ve met who can intimidate Dad. Then there’s Evy. She’s about my age, so around 25, and a lieutenant in the Research and Technology division. I think she lives off stimjuice – that’s fruit juice with added caffeine and vitamins. And I’m not sure she actually bothers to breathe when she talks, but she is brilliant and super sweet. There’s also Lincon, who is the one who initially arrested me and kept an eye on me until my dad arrived. Turns out he’s the son of my dad’s best friend, and training to be a paladin himself. He’s been incredible through all this, even though his dad is one of the missing paladins. Was that a smile when you mentioned Lincon? Umm… maybe? I mean, technically we’ve known each other my entire life, but Dad and I moved away when I was three, so I don’t even remember playing with him as children. So really, I’ve only known him a few weeks – that’s way too short to form a romantic attachment, right? What is something you really hate? Callousness. That’s the worst thing about the Alfath: they think they are above everyone else and don’t care how much suffering they inflict to get their way. There’s a cafe near the museum that has an incredible latte made with mittinut syrup and topped with whipped cream and flakes of ice chocolate. I’d treat myself to one to kick-off each semester at Academy. I think my favorite color is blue. Earth was called the Blue Planet at one point, and I like to think the color connects us to our ancestors. I’ve been a so wrapped up in studies the past seven years that I’m not sure I have a relaxing pastime beyond weekend pizza and ale with my housemates. Um, something not studies related… ah! Running! I like to go running with Evy and Bet. My plan used to be to get my degree, land a faculty position in one of the academies, and build my prestige so I could convince the government to launch an expedition to Earth and see if that asteroid really did hit the moon and the effects it had on Earth. Now, though, I can’t even plan on being in the same place for more than a month. I saw the pictures. I’m pretty sure the Alfath aren’t the only human-passing aliens on Thelios. Kelly Phillips has always enjoyed making stuff up and telling stories, but it still took her husband over twenty years to convince her to become a writer. She strongly suspects he really just wanted some peace and quiet, and figured she couldn’t type and talk at the same time. Heh… poor sucker. In addition to talking while she types, Kelly enjoys a well-brewed cup of coffee, baking, and jewelry design. 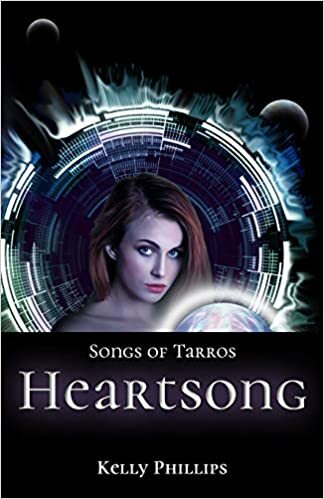 You can find Caelynn on the pages of Songs of Tarros: Heartsong. Join us next week to meet a man privy to the secrets plaguing the emperor Tiberius’ reign. Please follow the site by email (bottom-right) to be notified when the next interview is posted.